Booking Live? > Ready to Dispatch Driver? > Passenger on Board? > Job Complete? You have two options to mark a job as 'live'. The first is your dashboard which you will see in the image below. You should aim to update the status of the job as soon as it appears on your dashboard so we know you have seen the booking. 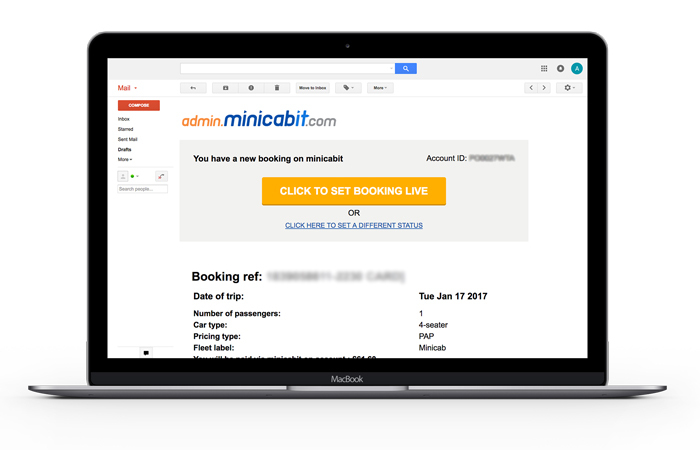 You also have the option of marking a job live via the booking confirmation email you receive once a customer books with your company. If you fail to mark a booking live soon after you receive it, the job will be reallocated to another Cab operator and you will incur a penalty. Should we have repeated issues with you not using the booking flow correctly and marking bookings as live, we will need to review our ability to display you on our platform as we must have confidence in your reliability. The second step of the booking flow is marking when a driver has been dispatched for the job. This option will be available 30 minutes before the pickup time plus the time it will take the driver to travel to the pickup address. For example, if the journey from the base to the pickup address would normally take 15 minutes, this option will appear 45 minutes before the pickup time. The next step occurs at the exact time of job. At this stage you can mark ‘passenger on board’ if the driver has picked up the customer. Once selected, the booking will disappear from the dashboard and will be processed for payment. The option will be available for up to 30 minutes from time of pick up, to give you time to update the system. If we do not receive confirmation that the 'passenger is on board' then you will be presented with the option to mark ‘job completed’ through the dashboard or the booking log. If you do not do this, the job cannot be processed for payment as we have received no confirmation the job took place.